Since the 1850s, air pollution provided enough sulphur for crop production in Ontario, except in the northwest. Since the world has been decreasing industrial pollution, some plants may need sulphur as a fertilizer. Ontario does not have a recommendation for sulphur application. Since brassicas are a group of non-leguminous crop that have a high sulphur demand and grow well in Northern conditions a trial was developed to see how these brassicas would respond to the sulphur. 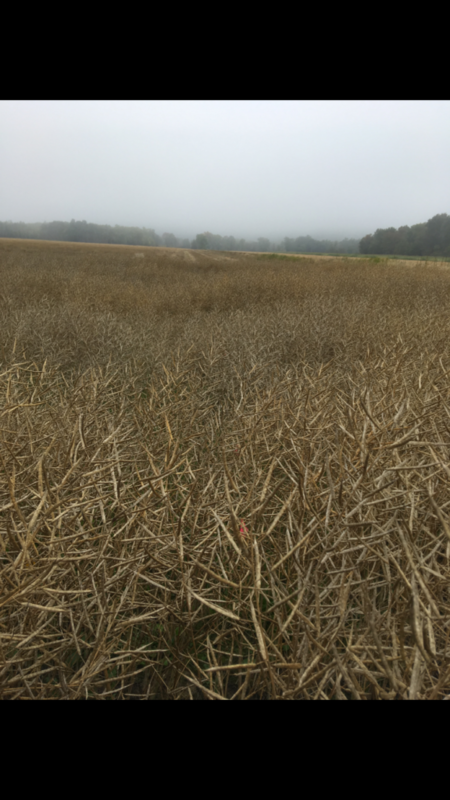 Three brassica crops were picked to represent Algoma producers accurately; canola for cash croppers, cabbage, broccoli, and cauliflower for market gardeners and a forage brassica mix that could extend grazing season for livestock producers. The third part of this trial was looking at the effects of sulphur on a canola crop. This project was in partnership with Thunder Bay Research Station (TBARS); Thunder bay had one location and Algoma had one location. 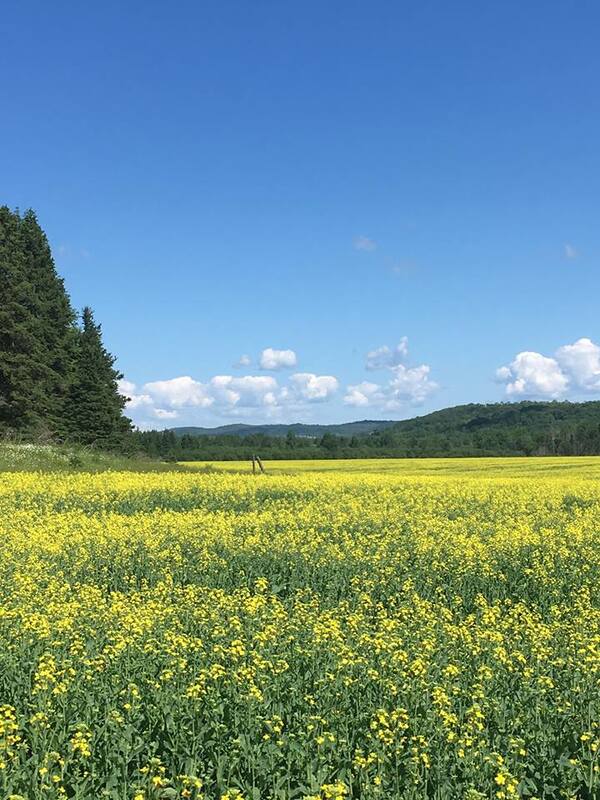 The location in Algoma was near Rydal Bank, where 40 plots of canola were planted and fertilized. The trials panned over half an acre, where four blocks, each block containing 10 plots was planted with canola variety- L252. The canola was planted on May 11, 2017. Background fertilizer of urea, phosphate and potash was applied as recommended from soil sample results. Two different sources of sulphur was applied, gypsum and elemental sulphur were used as the sources. Each fertilizer was applied at 0 kg, 12 kg, 24 kg, 36 kg, or 48 kg in each block. Tissue samples were collected at bolting stage and 25% flowering; but due to data loss of the tissue samples at the 25% flowering stage, samples were taken at the green pod to compensate the loss. The samples were analyzed for general nutrient uptake as well as sulphur uptake. The canola showed a significant uptake of sulphur during the bolting stage compared to the green pod stage. 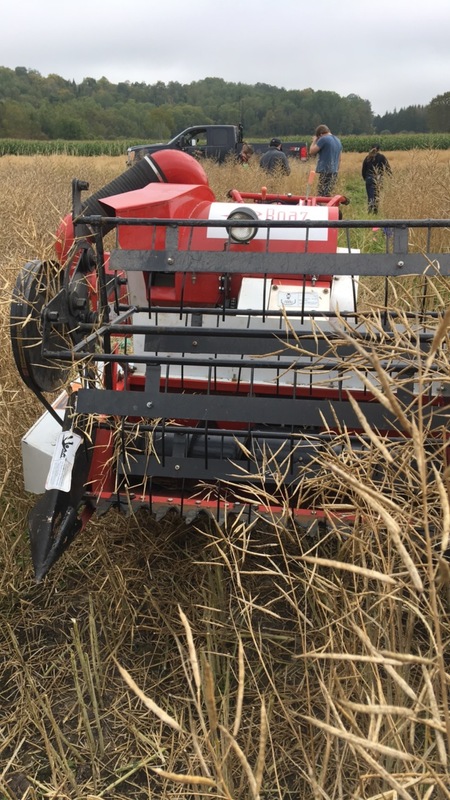 The canola was harvested on September 12th-15th, 2017 by RAIN’s research mini combine. Due to mechanical problems with the combine some of the plots were harvested by hand, using buckets. Samples that were hand harvested were noted, and analyzed separate. 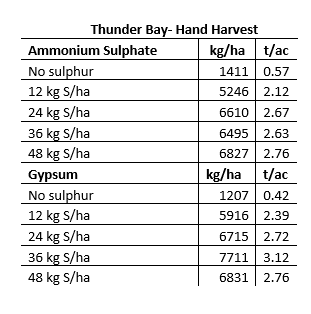 The project was duplicated in Thunder Bay, where yields came back showing, that the higher the level of sulphur (either gypsum or ammonium sulphate) produced a higher yield. Since Algoma received a considerable amount of rain, this may have impacted Algoma’s yields. 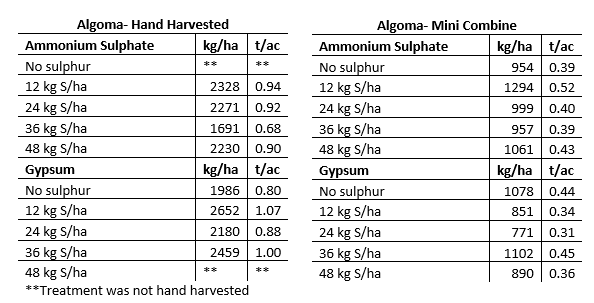 Algoma’s yield did increase with the higher levels of sulphur but after analysis, no correlation was shown between the yield and the amount of sulphur. The yield differences between machine harvested, and the hand harvested canola is significant. This can be attributed to machine loss. Using a machine to harvest is not as accurate as hand harvest. Soil samples were conducted post-harvest to determine the complete nutrient uptake of the canola. Results did not show any significant difference in the treatment rates when it came to overall nutrient uptake. This trial showed that the sulphur did influence yield, the higher level of sulphur (either gypsum or the elemental sulphur) increased the yield. Producers should consider adding sulphur to their fertilizer applications on canola. A second year of this trial would be ideal, where more exploration could be done to see what the efficient rate of sulphur is.